Originally written April 2011, updated August 2014. Myth: A doula will discourage pain relief/not work with you if you have an epidural/only attend out of hospital births. Fact: A doula will help you learn about a variety of non-medication pain relief options IF YOU WANT THEM. If you want the anesthesiologist to meet you at the door of the hospital to get that epidural started then that's absolutely your choice. (Our job as a doula is to make sure you know your options and we support YOUR choice.) I have personally used an epidural in one of my births and if I could have gotten out of bed I would have hugged the anesthesiologist! Myth: A doula will interfere with medical advice/tell you to ignore medical advice/argue with the hospital staff/hates hospitals. Fact: Hospitals are life saving in emergencies and I am so, so thankful for the technology they provide. I chose to birth in a hospital three times, and I'm incredibly grateful for their care. 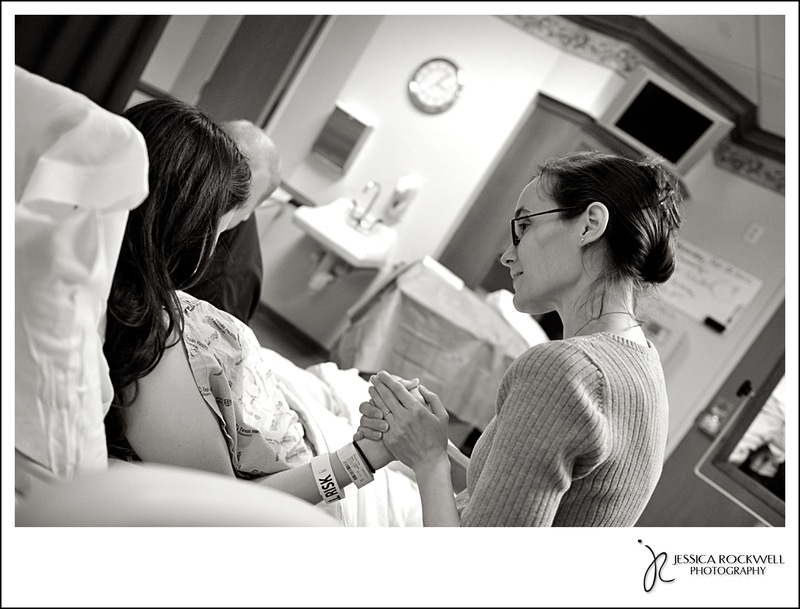 Many families are most comfortable birthing in a hospital and a mother's comfort and sense of safety are crucial to a positive birth experience. As a doula I do not speak to the hospital staff for you, I simply remind you of any questions you may have or wishes you expressed. If you are otherwise engaged (i.e. distracted from labor!) then I'll encourage your partner to speak on your behalf. I can help you learn more about medical options and explain terms to you, but I do not make decisions for you, I do not give medical advice, and I do not speak to the staff for you. I am your guest at the hospital and it's in my best interest to ensure a peaceful relationship with the hospital so I can better serve you. Now that I've been a doula for a few years I have heard from care providers about some troubling encounters they had with doulas who did interfere with medical care, were confrontational with staff, or in other ways contributed to a negative situation rather than focusing on supporting the mom. I better understand now why some hospital staff especially may feel hesitant when they hear a couple has hired a doula and I am trying very hard to make sure my interactions with staff are always respectful. My personal reputation as a doula is important to me, but I also know that MY behavior impacts how they feel about all the doulas to follow. Myth: I don't need a doula because I'll get support from my partner/midwife/OB/nurse/mother. Fact: While each of those people provide support to you, their roles are different from that of a doula. Your midwife or OB is your medical care provider and with few exceptions, they will not be in the room with you while you labor. Generally in a hospital setting they arrive in time for pushing and catching. Your L&D nurse is monitoring you medically but again, she does not remain in the room with you continuously and she is also monitoring other laboring mothers and performing job related tasks (charting, etc) that take her away from your bedside. While many L&D nurses are fantastic in the role of doula, she may have very little experience with women seeking a non-medicated birth and won't have the same tips and options a doula has learned, such as position changes, massage, etc. Your partner will ideally be your primary supporter during birth, but their experience with births may be limited! Your doula can help explain terms to your partner, remind them of your birth wishes and goals, demonstrate ways to provide physical support to you, and give your partner a chance to run to the restroom without leaving you alone! Mothers (sisters, aunts, friends) can also do an amazing job of playing doula, but may not have the same knowledge base to draw from to help you cope with labor. Those closest to you are also going to be unable to remain objective and may lovingly but unintentionally interfere with your birth goals. doula - your maid of honor. We're here to make your day go more smoothly, to smile and reassure you, and to remind you of how beautiful and amazing you are. As a mother working with a doula, my already incredible husband was able to focus even more closely on caring for and reading my needs in labor when we worked with a doula. Our doula was able to focus on the logistics and reminders so my husband could focus solely on providing the emotional support I needed. We both benefitted from hiring a doula. Doulas can provide support in varying ways. Primary support is when you are laboring without a partner and your doula provides all of your emotional and physical support. Secondary care is when your doula works alongside your partner, both providing emotional and hands on help. The third option is that the doula provides "invisible" care, providing support to your partner to benefit you through quietly assisting with reminders, providing drinks, and warming rice packs. Myth (Sort of! ): You can always find a student doula willing to work for free. Fact: While this is true in some circles, as a doula community we are really trying to change this belief that someone should provide such a valuable service for free. Doulas in training have invested a great deal of time, energy, money, and knowledge into becoming doulas and they are valuable. While most offer a discount for their certification births, please don't ask doulas to work for free. Doula work is worth the financial investment. I chose to work with a student doula and she was phenomenal, but I've also heard some worrisome stories from parents about student doulas who were either not helpful or even hurtful. Be diligent about your interviews and find the right fit for you, recognizing that a doula with many births and years of experience will bring something else to the table than a new doula with just a couple births. Not to discount the value of student doulas, but if you have any types of special concerns then consider finding a doula with the experience you need. Any other myths you've heard?? This entry was posted in Birth, Doulas, TIPS FOR DOULAS and tagged Denton Texas labor support birth doula, Doula Resources, New Doulas, Tips for Doulas. Bookmark the permalink. 4 Responses to Doula Myths | Tips for Doulas AND Parents! This was great to read… kind of entertaining really. I admit I was laughing through some of it. One Myth I hear a lot (coming from a community where Doula’s are not used very frequently) is that a Doula is the same as a Midwife. While a lot of Midwives are also Doula’s, Doula’s do not act as Midwives in that the do not perform medical procedures. 🙂 Loved this read, thanks for it!